Kerry calls on Tehran to 'prove it wants to be member of int'l community' by stopping its Houthi rebels in Yemen and escalation in Syria. US Secretary of State John Kerry urged Iran on Thursday to help end wars in Yemen and Syria, where Tehran and its Gulf Arab rivals are backing opposing sides. Kerry called on Iran to "help us end the war in Yemen...help us end the war in Syria, not intensify, and help us to be able to change the dynamics of this region," he told a news conference in Bahrain ahead of a meeting with his Gulf counterparts. Iran has been supporting the Shi'ite Houthi rebels in Yemen, who launched an uprising to overthrow the government. In Syria, their Lebanese proxy terror group Hezbollah has been fighting to prop up Bashar al-Assad's regime, and Iranian troops have long been active in the fighting as well. 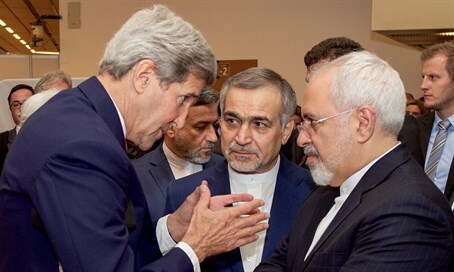 The secretary of state said Tehran should "prove to the world that it wants to be a constructive member of the international community and contribute to peace and stability." Bahraini Foreign Minister Sheikh Khalid bin Ahmed al-Khalifa, whose government accuses Iran of stoking persistent protests among the kingdom's Shi'ite majority for an end to Sunni minority rule, echoed the call. "Yes, we do want to see Iran change its foreign policy," he said, speaking alongside Kerry. All the Gulf Arab states, apart form Oman, are taking part in a Saudi-led coalition that has been battling the Iran-backed Houthi rebels in Yemen since March last year, in a war which the United Nations says has killed around 6,300 people. The Gulf Arab states have also been staunch backers of Syrian rebel groups who have been fighting to overthrow Assad's regime since 2011. Aside from Iran, Russia has been another key supporter of the regime in a conflict that has killed more than 270,000 people and pushed nearly five million into exile.